Panic's Transmit has long been a very popular Mac FTP client, but version 3 was starting to look tired, and, in terms of features and speed, the app was being challenged by eager young upstarts, such as the likes of ForkLift. But, thankfully, the grizzled veteran has been reborn. And with the updates come an impressive slew of interface and usability improvements, which again sees it streak way ahead of the pack, leaving them for dust. From the off, it's fairly obvious that this is a brand-new Transmit, and not just a minor upgrade. The interface oozes class, being both totally Maclike and very modern. Animations and neat touches are peppered throughout, and while some might dismiss these as eye candy (or dislike certain choices – for example, we're not keen on the 'skinny' Favorites list scrollbar and use of a light Helvetica Neue font weight for some headings), that misses the point, because little in Transmit 4 is superfluous. Instead, the interface balances usability and clarity – especially important for newcomers – with flexibility for long-time users. While Transmit's main window initially appears similar to Transmit 3's, new view options are akin to Finder. There's Quick Look support for document previews, and you can navigate files and folders via collapsible lists, icon view or Cover Flow; also, both panes can be set to local views, turning Transmit into a dual-pane Finder of sorts. 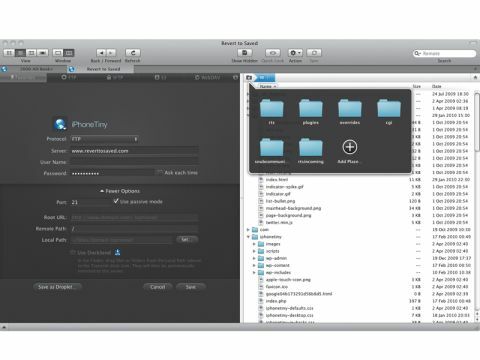 Further view options enable folders in lists to be placed above files, and there's a 'one file browser' option for users who prefer uploading files by dragging them from Finder. Speaking of Finder, the new Transmit Disk feature enables you to dispense with Transmit's window for basic transfers. You choose a server from the menu-bar extra and it mounts as a disk. This won't be new to hardened MacFUSE aficionados, but it's a nice little bonus for Transmit users, and during testing we found the feature worked well. Meanwhile, back in Transmit proper, most of the other changes will enable you to be more efficient. The appliction is noticeably faster, especially when you are working with smaller files. The new Places feature enables you to define shortcuts within your favourite locations by dragging a folder to the icon at the top-left of the current pane. To later access a Place, click the icon and then a location to load it. Another particularly standout feature – and one that demonstrates just how much effort has been made with regards to usability – is Sync. The user-friendly pane makes it very clear whether local or remote files will be used as a reference set, and a speech bubble details what's going to happen. Rules can be defined to further refine the sync, and there's a handy Simulate option that enables you to test results without having to commit to any transfers. As if that wasn't enough, you can also add into the mix FXP and S3 support, an excellent new transfers view, tear-off tabs, multi-touch navigation for laptop users, and a whole bunch of other cool tweaks and extras. And there you have the Mac's best FTP client. The conclusion is, if you're searching for a robust, usable and great-looking FTP client, we highly recommend Transmit 4; and for Transmit 3 users, there are more than enough useful improvements to justify the $19 (£14) upgrade fee.